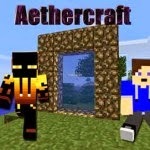 AetherCraft Mod in short, is a mod about aether. What is aether, you may ask? Aether is the one material that makes up all objects you can see, the one thing that binds together all matter. Up until now, this material has only been existent in theory. Now, you have the tools to convert things to and from this ur-substance! With the tools AetherCraft gives you, you can both convert items into pure Aether and turn Aether into items. You can even use Aether to charge items of great power! Fixed the bug with avmultiplier config option. Rings now deactivate in containers and re-activate when out of them. AV config files now save by ID name rather than unlocalized name. Old config files still work for now. be sure to update any config files you have with /aec edit and /aec save before using any future versions of this mod! Added Tier 3 machines: the Gilded machines will be able to handle EVEN MORE AV then ever before! Fixed block textures not appearing in game. Added new config option to change the AV limit independently of flow rate. Added 6 new Aetheral tools: The Pickaxe, Shovel, Axe, Sword, Hammer, and Shears. They consume AV to dig faster. Added the Ring of Repair. This ring will use AV to repair your tools. Fixed a bug with the IC2 crafting handler. Improved the conduit item renderer. Minecraft Mod Download Minecraft 24.05.2014 Zeppelin AirCraft Mod 1.7.2/1.6.4 Dowland 2014 MineCraft Free Mods Texture Packs Map Skin Tools Seeds Download.